Crisp corn tortilla chips served topped with melted Cheddar and Jack cheese. Three hand-rolled corn tortillas stuffed with chicken or pork and sliced jalapeños, fried and served with guacamole and sour cream. CHILE CON QUESO $6.15 Gluten-Free. A hot, spicy cheese and chile Mexican dip served with warm crisp corn tortilla chips. Hatch green chilies, tomato, onion, spinach, and artichokes mixed in a creamy dip. Served with celery and carrot sticks. 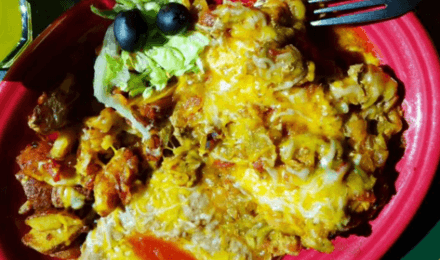 A crisp, deep-fried flour tortilla layered with beef or chicken, onions, green chile, tomatoes, black olives, and smothered in Cheddar and Jack cheeses. Jalapenos upon request. 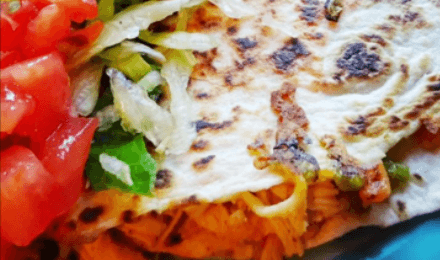 A blend of Cheddar and Monterey Jack cheeses, onion, tomatoes and green chile grilled between two flour tortillas, garnished with lettuce, guacamole, diced tomatoes and sour cream. Served with celery sticks and bleu cheese or ranch dressing. Fresh guacamole served in a crisp corn tortilla shell on a bed of fresh chopped lettuce topped with diced tomatoes. 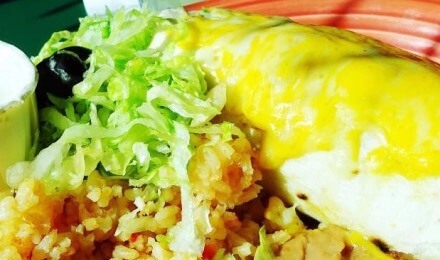 Two fresh ranch eggs cooked to your liking on soft corn tortillas surrounded with your choice of Chile Verde or Chile Colorado and cheese served with refried beans and Spanish rice and two warm flour tortillas. 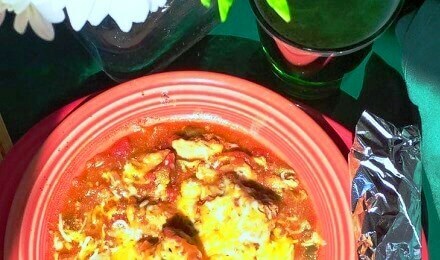 A fluffy three-egg omelette and cheese smothered with your choice of Chile Verde or Chile Colorado served with zesty grilled Pappas and two flour tortillas. 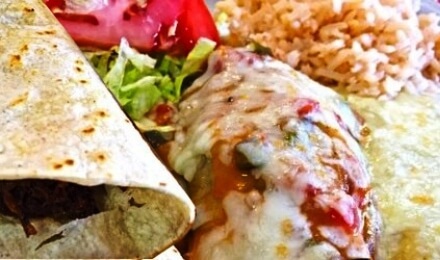 Two eggs scrambled with sausage, chorizo, pico de gallo and zesty grilled Pappas wrapped in a flour tortilla smothered with red or green enchilada sauce served with grilled Pappas. 5oz grilled skirt steak, spicy chorizo topped with two eggs served with refried beans, zesty grilled Pappas, and two flour tortillas. 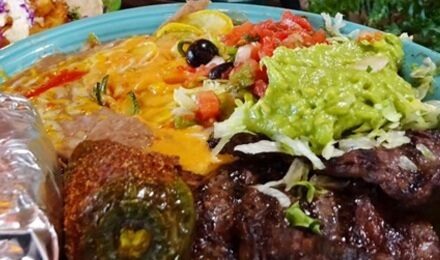 A large salad with your choice of beef or chicken fajita meat, sauteed onions and bell peppers, guacamole, sour cream, tomatoes, cheese, black olives and pico de gallo served in a crisp flour tortilla bowl. Gluten-Free if ordered without the shell. Seasoned grilled chicken on top of mixed greens with bell peppers, grilled corn, and black beans. Gluten-Free. 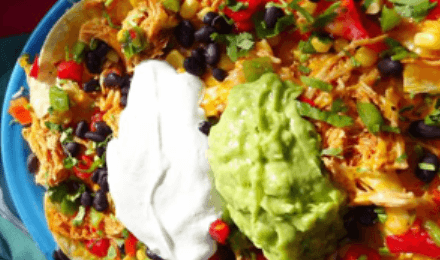 A large salad with chicken, red and green bell pepper, corn, black beans, cilantro, avocado, cheese and Mexican croutons served in a crisp tortilla bowl. Gluten-Free if ordered without the shell. 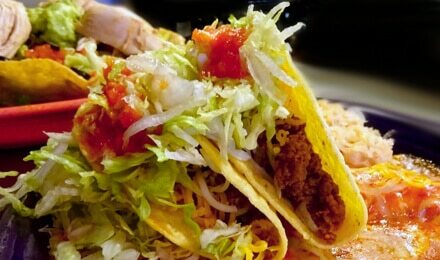 A large salad with deep-fried chicken tenders smothered in a spicy buffalo sauce, red and green bell peppers, cheese, corn, black beans, cilantro, jalapenos and Mexican croutons served in a crisp tortilla bowl. A large salad with chicken, guacamole, cheese, fresh lettuce, black olives and diced tomatoes served in a crisp flour tortilla bowl. Gluten-Free if ordered without the shell. Your choice of dressing. Gluten-Free. 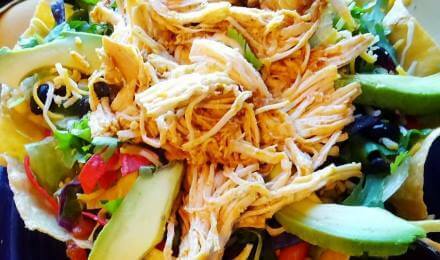 Mesquite smoked pork on top of mixed greens with bell peppers, grilled corn, black beans, and avocado Gluten-Free. 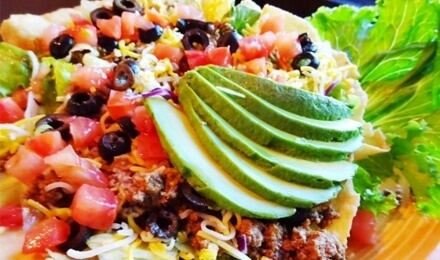 A large salad served in a crisp flour tortilla shell with spicy taco meat, cheese, fresh lettuce, avocado, black olives and diced tomatoes. Gluten-Free if ordered without the shell. A large salad with fresh lettuce, sliced deep fried shrimp, diced tomatoes, black olives, and cheese served in a flour tortilla bowl. A large salad with sliced deep-fried chicken strips, diced tomatoes, black olives, Cheddar and Jack cheeses served in a crisp flour tortilla bowl. 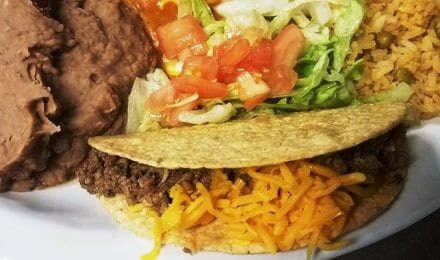 A crisp flour tortilla with refried beans, topped with beef or chicken, shredded lettuce, diced tomatoes, guacamole, black olives, cheese, and garnished with sour cream. Gluten-Free if ordered without the shell. 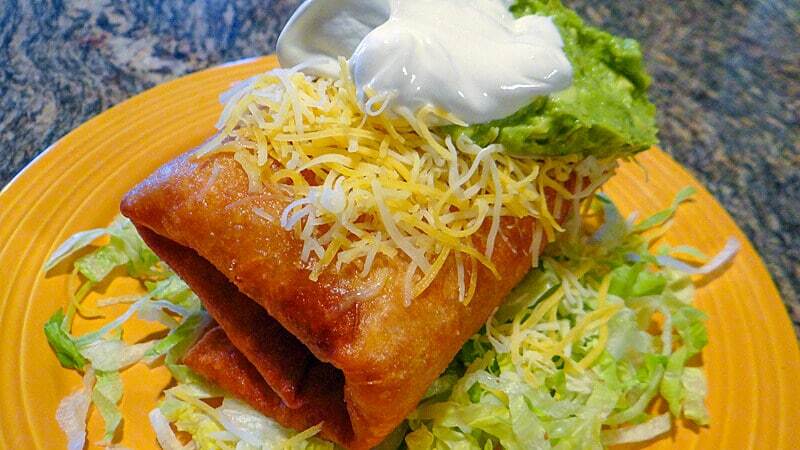 A large sopapilla topped with refried beans, your choice of chicken or beef, shredded lettuce, diced tomatoes, guacamole and garnished with sour cream and black olives. 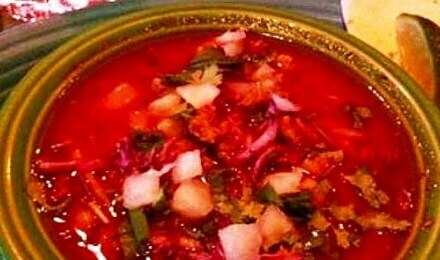 POZOLE with two corn tortillas $8.55 Gluten-Free. Gluten-Free if ordered with salad. 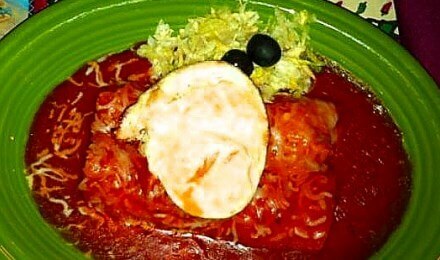 A large flour tortilla stuffed with your favorite filling topped with red or green enchilada sauce or white cream sauce. Served with refried beans, Spanish rice, and sour cream. 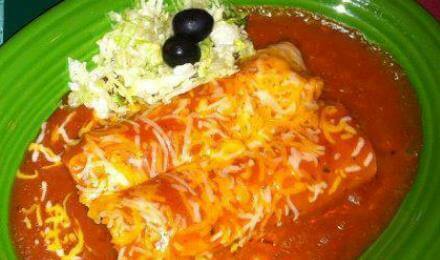 Spicy beef or chicken, refried beans, diced tomatoes, onions, shredded lettuce, and cheese rolled up and smothered in red or green enchilada sauce. Beer battered Alaskan pollock, cabbage, onions, and cheese, smothered in white cream sauce. 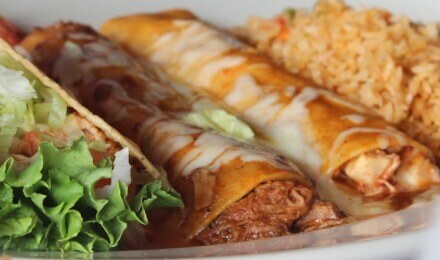 Grilled flank steak rolled up and smothered with red or green enchilada sauce. Grilled shrimp, pico de gallo, cabbage, and white sauce wrapped in a flour tortilla. 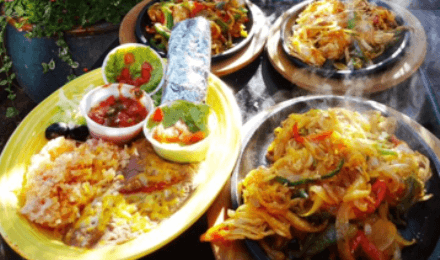 Grilled steak or chicken, sautéed onions and bell peppers, pico de gallo, and cheese, all wrapped in a flour tortilla. 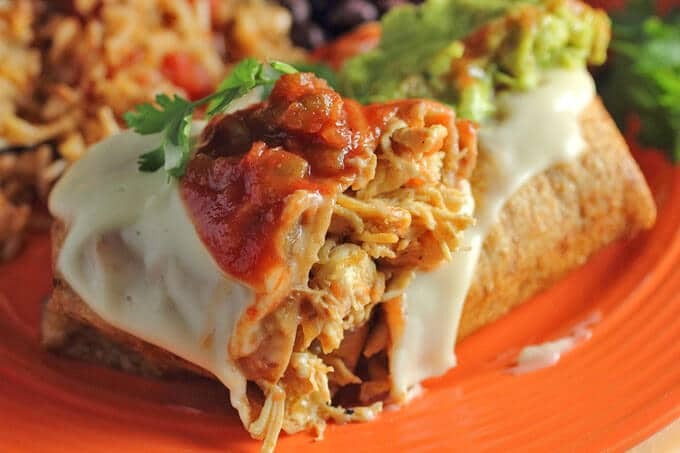 A flour tortilla stuffed with your choice of fillings, deep-fried, smothered in green enchilada sauce garnished with sour cream, black olives, tomatoes, and guacamole. Choice of meats. Sauteed bell peppers, and onions. 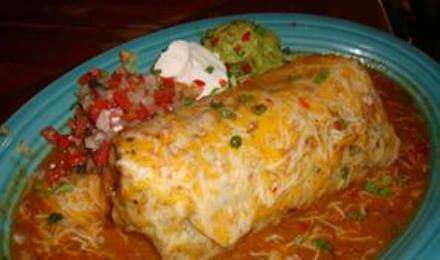 Served with refried beans, Spanish rice, guacamole, pico de gallo, cheese, and sour cream. Includes 4 flour tortillas. Gluten-Free if ordered with corn tortillas. Served with Refried Beans, Spanish Rice, and Guacamole Salad. 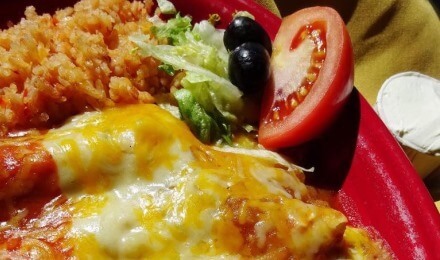 The Deluxe Mexican Dinners are served with your choice of Red or Green Enchilada Sauce or White Cream Sauce. 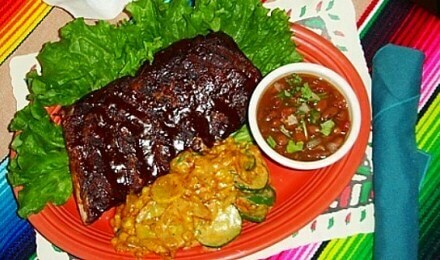 One pound of Mesquite smoked chipotle honey lime ribs served with calabacitas and whole pinto beans. Gluten-Free. 8 oz. 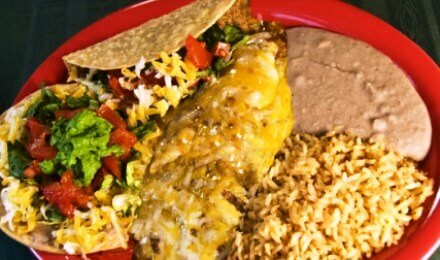 New York steak cooked to order, smothered in La Casa Fiesta’s zesty Chile Verde or Chile Colorado and cheese served with refried beans, Spanish rice, and two warm flour tortillas. 6 oz. of mesquite smoked pulled pork served with calabacitas, refried beans, Spanish rice and two flour tortillas. Gluten-Free. Perfectly seasoned flame grilled skirt steak served with refried beans, calabacitas, guacamole and pico de gallo. Gluten-Free. 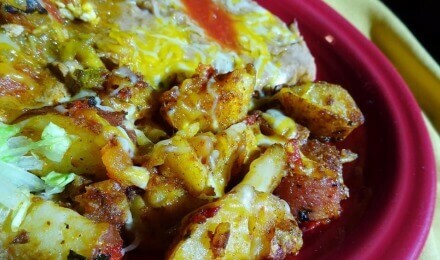 Cubed pork cooked with red chile or green chile. Served with refried beans, Spanish rice, and two flour tortillas. Two Hatch-grown chiles, stuffed with spicy beef, cheese, and onion, grilled in egg batter to a golden brown, smothered with green enchilada sauce. Served with refried beans, Spanish rice, and sour cream. Gluten-Free. Our zesty Chile Verde or Chile Colorado and cheese served with a tamale, beans, rice, and two warm flour tortillas. 8 oz. 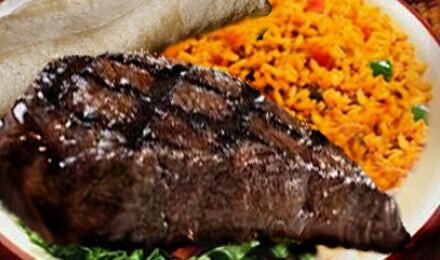 choice grade New York Strip charbroiled and served with a lettuce and tomato salad, your choice of dressing, fries or Spanish rice and tortillas. Gluten-Free if with Corn Tortillas. 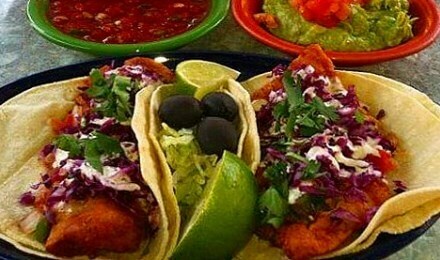 Five large breaded shrimp, deep fried to a golden brown served with a lettuce and tomato salad, dressing of your choice, tangy shrimp sauce, fries or Spanish rice and tortillas. 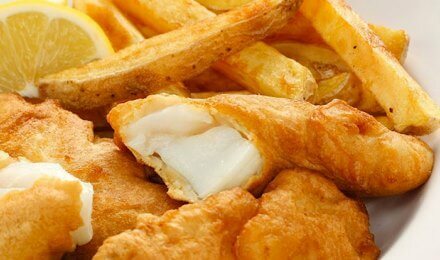 Three pieces of beer battered Alaskan Pollock deep fried to a golden brown and served with tartar sauce and fries or Spanish rice. 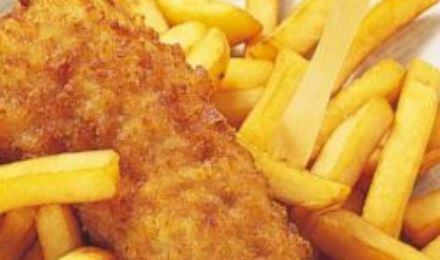 Three pieces breaded all white chicken fried to a golden brown and served with fries or rice. 6 oz. Charbroiled Angus beef topped with pepper jack cheese. Served with fries. 6 oz. Charbroiled Angus beef topped with pepper jack cheese and green chile strips. Served with fries. 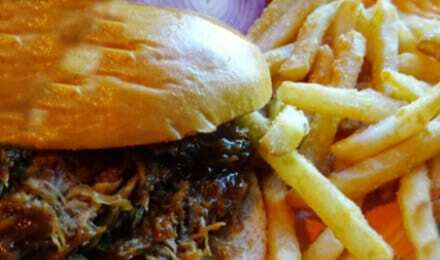 Tender smoked pork with bar-b-que sauce piled high on a bun. 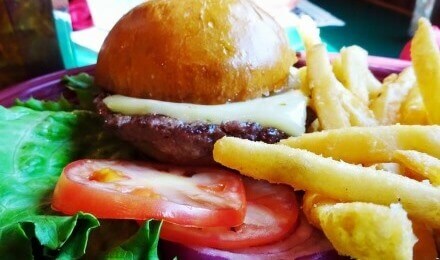 Served with fresh onion and fries. 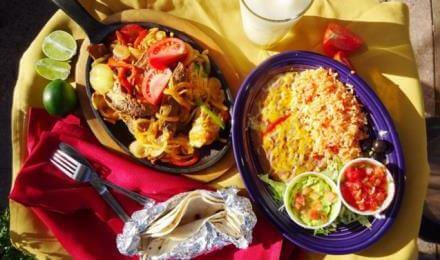 A large flour tortilla folded with two quarter-pound patties, beans, onion, tomato and cheese smothered with Chile Verde or Colorado. Served with fries. Baby Plate (3 and Under) Taco Meat, Refried Beans, and Spanish Rice $3.60 Gluten-Free. A flour tortilla stuffed with a Snicker’s bar, deep fried smothered in caramel sauce and chocolate and a scoop of ice cream. 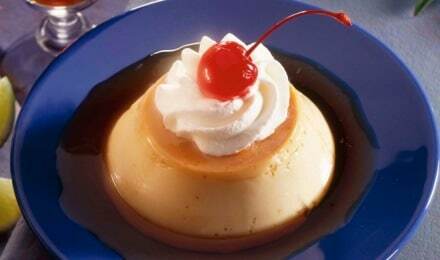 A classic Mexican custard, with a hint of caramel, topped with whipped cream. Gluten-Free. 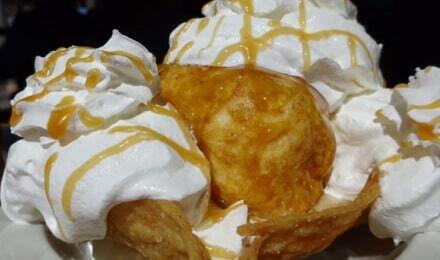 Refresh your taste buds with a cold and crunchy Fried Ice Cream dessert. Vanilla. Vanilla ice cream topped with your choice of chocolate or caramel topping and whipped cream. Gluten-Free. EL PRIMO MARGARITA — Sauza Blue Reposado Tequila, Gran Gala Liqueur and a splash of amaretto. GRAND GOLD MARGARITA — Sauza Blue Reposado Tequila and Gran Gala Liqueur. WHITE LIGHTENING MARGARITA — Sauza Blue and Gran Gala Liqueur. HORNI MARGARITA — Sauza Hornitos Tequila, Gala and OJ. 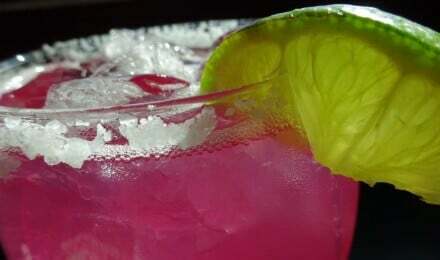 Above Margaritas served by the glass or 32 oz. carafe. Your choice of frozen or on the rocks, Regular, Strawberry, Peach or Prickly Pear. RED ROCKER — Cabo Wabo Blanco, Gran Gala, fresh lime and orange juice shaken with cranberry juice. MARGA-TINI — Patron Silver, Gran Gala, fresh lime and orange juice shaken and served up with a salted rim. SILVERADO — Your choice of Silver Tequila, fresh lime juice, and simple syrup. HANDMADE — Your choice of Tequila, Patron Citronage, fresh lime and orange juice shaken.